Google rich snippets. What the heck are those? They’re these awesome things that can help youimprove your SEO, and generate more site traffic from the SERPs, and I’m going to tell you how to set them up in this post. Bet I got your attention now, right? Well to answer your question, let me first pose another question to you. Have you noticed that when doing a Google search, certain listings just look sexier than others? 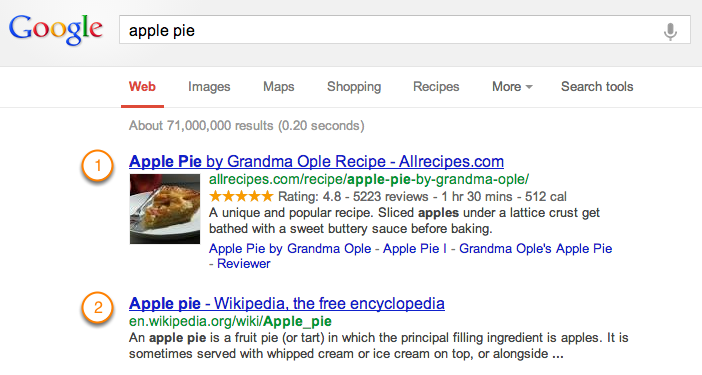 For example, if you were doing a search for “apple pie,” which of these listings when you rather click on? I bet you chose option #1. If you didn’t, you must really not like apple pie. So what are these sites doing to make their Google listings include all these extra details? The secret to these fancy pieces of information are rich snippets that these websites have coded onto their website pages. Google rich snippets extract information from your website to display on your site’s listing in the search results, in addition to the typical page title, page URL, and meta description. This extra information can include photos, ratings, author information, and more. Rich snippets are often overlooked in businesses’ SEO strategies because they are more difficult to implement that traditional on-page SEO strategies. But it would be well worth your while to spend a little time learning how to do this. Adding this content-rich information to your Google search listings draws the eye and can increase your listings’ click-through rates by 30%, even when you’re not in the #1 position. How are rich snippets installed? Okay, so here’s the tricky technical part. There are a few options for how to install rich snippets, but I’m going to show you the easiest method: using microdata. Since I don’t want to confuse you, I’m only going to show you this approach — and once you get the hang of it, it’s really not too difficult! 1) Learn what microdata is. That bit of code will be written using HTML5. Don’t worry, you don’t need to learn an entire coding language — microdata uses very simple HTML tags, such as <span> or <div> tags to assign descriptive terms to each bit of information. My name is Diana Urban, and I was born and raised in New York. My name is <span itemprop="name">Diana Urban</span>, and I was born and raised in New York. 2) Start marking up your content. Review the different types of rich snippets below. Each rich snippet links to Google’s instructions on how to set up each type of rich snippet — when you load their page, always select the microdata approach to get the right instructions. 3) Test your rich snippet. Google Webmaster Tools has a nifty feature that lets you test your rich snippet. Click here to use their Structured Data Testing Tool. This will confirm whether or not Google can read your markup data and whether your rich snippets are appearing in their search results. If you don’t see your rich snippets in Google’s search results right away, don’t freak out. It actually takes Google as long as a few weeks to crawl and index this new data. So go to the beach. Sip a margarita. Soak in some sun. Okay, it’s more likely that you’ll just keep working on other stuff in the meantime, but a girl can dream. What types of rich snippets are there? Let’s run through some of the different types of rich snippets that are available to use on your website. Each section links to Google’s instructions on how to actually install the rich snippets — remember to select the microdata option for the easiest installation process! A rich snippet about a business or organization can include location information, contact information, price ranges, hours, and customer reviews, if there are any available. Event snippets include the date, location, and time of the event. If there are more than one option for the events, up to three will be displayed. 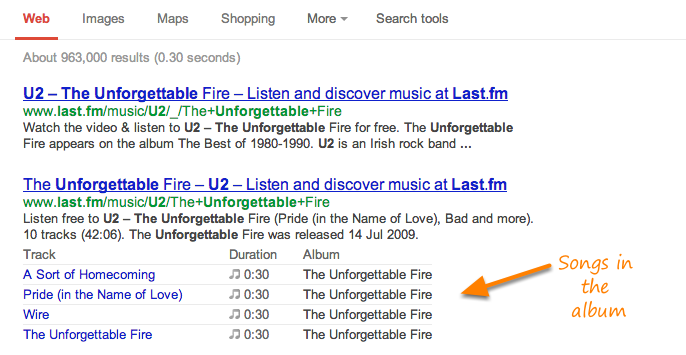 Using music album rich snippets will display links to individual songs in an album, or even lyrics to the song if available. The people snippet displays information such as a person’s job title, the company they work for (a.k.a. affiliation), and location. It can also display a photo, nickname, and more. People snippets are different than author snippets. Here is the difference, with an example of yours truly. Product rich snippets include things like a picture of a product, ratings, and price range of the product. Recipe rich snippets provide users with additional information about a specific cooking recipe, such as the ratings (1 to 5 stars), cook/prep time, and calorie information. You’ve already seen a bunch of examples of snippets that have 5-star ratings included. But you can also set up a snippet that is just the review portion. If you want a thumbnail of a video to display next to your search listing, the markup works a little different. Google recognizes the Facebook Share markup code, so you might as well kill two birds with one stone.